In 1998, I was enlisted in the Canadian Navy for an exercise called “RimPac.” During this exercise, I had the opportunity to visit several countries that I had never visited before. They included: Japan, Korea, Russia, China and Mexico. I was so enamored with these new countries that I started looking into how I could spend more time visiting them. Becoming an ESL teacher would allow me to visit these countries and work so that I could actually get to know the people and cultures a bit. 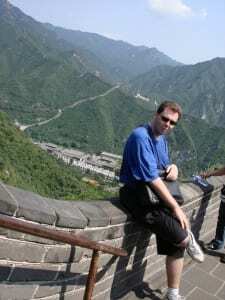 About the author: Devin completed the 120-hour TESOL certificate course and taught English in China between 2002 and 2010. In this blog, Levin explains how to overcome the challenges of teaching in China, the lifestyle, the teaching methods, and the job hunting process. There are so many things that I felt grateful to experience while working overseas. Firstly, of course, was the friends I met. As an ESL teacher there was never a shortage of people around me who were eager to get to know me and, of course, I felt the same way about them. In fact, I’ve been back in Canada for 8 years and still regularly chat with many of the friends I made during my time abroad. Secondly, teaching English in China felt so different from teaching in Canada. The enthusiasm you get from the young students is unparalleled! I looked forward each morning to walking into my classroom and seeing the students stand up and greet me in unison. Then the lesson that followed was usually full of fun and games. I mostly focused on conversational English and the students loved having the chance to practice what they’d learned from their Chinese English teachers. I originally focused my job search in Harbin, the capital city of the Heilongjiang province. What attracted me to this city was how beautiful photos of the snow and ice festival looked when I was researching where to teach, as well as how close Harbin was to Russia (Indeed it used to be a Russian city) so there was a mix of Chinese and Russian culture and architecture. I also knew that, at six foot three, there’d be a better chance of finding clothing in my size. I was able to explore more of the country and found myself from the extreme cold of Harbin to the extreme heat of Shenzhen in the south of China. 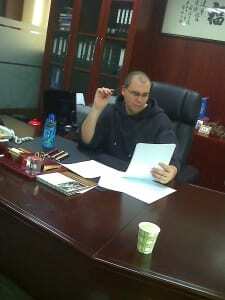 In total I spent eight years teaching in China, the first two in Harbin and the last six in Shenzhen. However, my wife owns an apartment there in Shenzhen and the idea of returning to teaching there is never far from my mind. I enjoyed the time spent there that much. Harbin is a beautiful city (especially in the winter) with it’s Russian influences, friendly people and beautiful snow and ice festival. Even though I was only there for two years it was always great fun both in and out of the classroom. Shenzhen, where I remained for my last six years, is another fantastic city. Very modern, close to Hong Kong, it is called a migrant city as people from all over China have come there to live and to prosper. It has all the modern conveniences and luxuries of any international city but it’s only a stone’s throw away from the charm of “traditional” Chinese life. The people, while far more busy than those in Harbin are still always friendly and willing to get to know you either in a classroom or at a dinner party over a glass of, well…whatever it is you guys choose to drink that night. It’s your party, you decide. The most difficult challenge I experienced was the language barrier. I’ve never been strong at learning other languages and Chinese is one of the hardest to learn, so there were many times I relied on my friends and colleagues to help me do basic things like visit a doctor, go shopping, pay my bills, or set up a bank account. There’s also the culture shock that many other ESL teachers went through. For some, it was the fact that no one would line up for buses or in fast food restaurants, or banks that left them feeling perplexed. For others, it was the differences in styles of education or being the center of attention almost anywhere you went with many Chinese treating foreigners as quasi celebrities. The best way to overcome these challenges is to research a little about your potential host country, their foods, their money, a bit of their history, their current politics and religions. The more you know (and you’ll never know enough until you get there) the less of a smack that culture shock is going to feel like when you arrive. I always found the standard of living to be very comfortable. Firstly, many schools were willing to rent out a room at no cost to me in return for signing a one year contract. Secondly, often the schools were paying money that not many private citizens were earning. This plus the free apartment gave me a lot of spending and saving power. And of course, aside from modern international luxuries like electronics and movie tickets, the majority of goods and services were unbelievably inexpensive. I often reminisce with a good friend of mine about those wonderful twelve dollar an hour foot massages that left me feeling like I was walking on pillows when they were finished. It was important to me that my first teaching job be with young adults. I thought that working with young adults would mean that I’d be meeting students with a decent foundation of English to begin with. This led to looking into jobs in Universities, high schools and private language centers. Once I had a list of schools I felt I’d like to work at, I wrote each of them an introductory letter and through correspondence I was able to find the school that was best for me based on the salary and benefits they offered, how much support I’d receive from them when I first arrived in China and what their expectations of me were. All this research and preparation paid off when I found myself at my new school and home. When I first arrived in China I did not realize there was going to be such a large difference in how education was handled between our two countries. I took for granted here in Canada our focus on group work, problem solving, critical thinking and self generated learning. In China this seemed to be the exact opposite. For the most part learning was individual. It was rote memorization. The teacher would present knowledge and the students would accept and assimilate it. This made for exemplary students in mathematics, science and engineering but in English courses many students were left with befuddled looks on their faces if you asked them to work in groups and create something from the tools you’d give them. I quickly had to adjust my methods of teaching to work with their strengths, the memorization, the repetition, and slowly introduce to them the idea of using these new words and to come up with their own dialogues, or role plays or free chats. I had to help them build up their confidence by showing them through more communicative activities that they could actually speak English rather than just recite it. Teaching English abroad has been one of the most eye opening experiences of my life. It’s left me with a lifetime of fantastic memories and stories to tell…I’ve also been given the honor of finding lifelong friends that have stayed connected with me since the first day I arrived in China until now. However, do your due diligence. Decide on your own goals and reasons for teaching abroad. Make sure you choose a country and a school that you feel will match those reasons. Then do your homework!